The Imperial College Healthcare Trust in London said it is to launch a pilot scheme aimed at "rewarding excellence" with better resources and research. The Department of Health says it wants to strengthen a scheme which rewards surgeons for high performance. But the Patients Association raised concerns about possible cash bonuses. The trust spokesman said it was looking at awarding bonuses for a specific procedure for which patient outcomes could be clearly measured, with a view to introducing it within a few months. "We are looking at a pilot scheme for a particular operation which will measure the improved functionality of the patient and we are looking at linking certain performance-related bonuses to that," he said. "At the moment we are in discussions with the surgical team." The trust later said the scheme would be about rewarding excellence across medical teams, who may in turn receive better resources and research opportunities if they have improved patient outcomes. 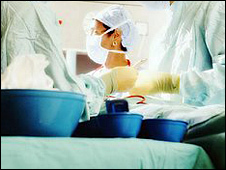 A spokesman denied that surgeons may receive any performance-related bonus or financial reward if their operations were judged particularly successful. Katherine Murphy from the Patients Association warned there was a risk that the most complicated cases would be forgotten because they would not guarantee the best outcomes. "Doctors already have a duty to provide high-quality care," she said. "I think a good doctor would be insulted by the idea that they will only do their best on the operating table if there is extra money in it." Meanwhile, Dr Jonathan Fielden, chairman of the British Medical Association's consultants committee, said it would be "far too simplistic" to reward individual surgeons according to the outcome of operations. He said: "The outcome of an operation is based on multiple factors, including the severity of the illness and the relative health of the individual. "Other members of the medical team would also have fundamental roles in the care a patient receives and the outcome achieved." One surgeon told the BBC that he found the idea "incredible" and "offensive". Professor Ellis Downes, a consultant gynaecologist at Chase Farm hospital in north London, said: "As a highly trained professional, I do my very best for my patients and I do not need financial inducements to persuade me to operate even better. "All our patients deserve the highest level of surgical care we can give them. It's a bit like saying to an airline pilot, if you don't crash your aeroplane we will give you more money." The Liberal Democrats said that while they welcome a scheme that rewards talented surgeons, it should not be used as an incentive to neglect the treatment of patients with complicated conditions who are less likely to make a full recovery. A review into the future of the NHS led by health minister Lord Darzi promised a system of care which focused on quality. The Department of Health spokesman said while the trust's pilot was not government controlled, under the Clinical Excellence Awards Scheme bonuses could be awarded for procedures such as hip operations, after which patient mobility could be measured. "Quality indicators such as complication rates and patient feedback are already used in specialties where they are available," he added. "As such measures become more widespread and robust, they will become increasingly influential in determining who gets awards."